Nellie Louisa No details available. Fanny b: Not known. Married Tom Buckle USA. Walter Robert 1877 – 1956. Married Rose. Percy Arthur 1886 – 1968. Grandfather of Robert Charles. Married Margaret Webb. Obituary from the Southampton Daily Echo: BLANDFORD – Killed in action on Dec 2nd 1917. Tom, the dearly beloved and youngest son of Joseph and Fanny Blandford, aged 20. 19 Trafalgar road, Freemantle, Southampton. “Duty done”. Joseph and Fanny are buried in Hollybrook Cemetery Southampton (section M6 plot 68) but there is no headstone still standing to mark their grave. Thomas was baptised on 5.3.1898 at Christchurch Freemantle, Southampton. His home address is given as 19 Trafalgar Road in Freemantle. His father’s occupation is recorded as a Labourer but by 1915 the Kelly’s directory shows Joseph and Fanny to be trading as coal dealers. This business was continued by their son Frank after the First World War as the directories for 1919 and 1925 show. The directory for 1915 shows Frank living at 13 Saxon Road and also someone named James, who does not seem to appear in the family history record as part of this family unit who were living at 22 Andover Road, both in close proximity to Trafalgar Road. Arthur Percy was at this time living at 73 Market Street, Eastleigh. Thomas attended Freemantle Church of England School, appearing on the school roll of 30.08.07, as Tom rather than Thomas, pupil no. 4022. Interestingly his d.o.b is entered as 23.12.87 and his father’s name is incorrectly entered as William. It is possible that his elder brother George William, who was his senior by 15 years, may have taken him to register for school and his name was entered on the record in error. Thomas left school in 1911 to start work. Two other brothers, Arthur and George, are listed as pupils of this school in a previous volume and correctly record Joseph as their Parent/Guardian. George’s entry shows that the family were living at a different address at this time. Thomas enlisted in the 2nd Bttn Hampshire regiment as Private 24619 and was killed on 2.12.1917 during the Battle of Cambrai in a fierce counter attack mounted after the sucesses of British and South African troops in the preceding days. 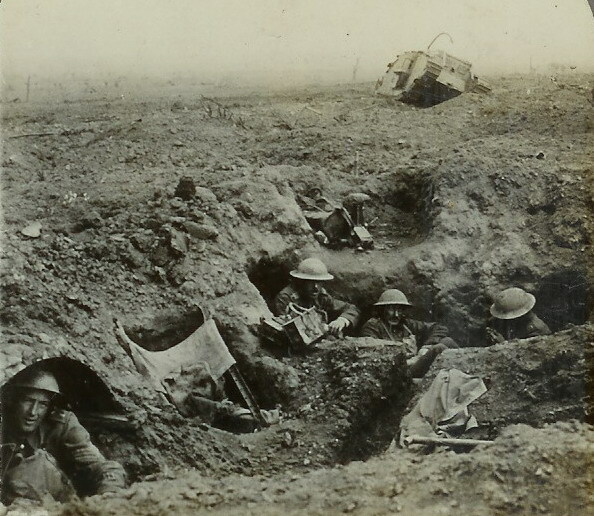 The Battle was fought between 20th November and 3rd December 1917. His memory is perpetuated on Panel 7 of the Cambrai Memorial at Louveral, Nord in France. He was one of the 7048 men to die in this battle for whom there is no known grave. Field reports for this fateful day in young Tom’s life tell us that his regiment had been deployed to re-enforce a position along the Hindenberg Line where the South Wales Borderers and the Newfoundlanders had previously suffered heavy losses. The Night of 1/2 Dec had been relatively quiet and it is noted in the field record that a little rain had fallen, but a cold frosty spell was setting in with a little sun at intervals and fair visibility. As just one generation later, it would be fought for yet again. But the price you paid, your sacrifice, should never be forgot. How often now I think of you and wipe away my tears. How can we ever understand the dreadful things you’ve seen. And pray you’re safely with your mates, not lying all alone. Mourned by every generation from the land that gave you birth. Cherished in memory always, our hero – England’s son. Thomas enlisted in the 2nd Bttn Hampshire regiment as Private 24619 and was killed on 2.12.1917 during the battle of Cambrai, which was fought between 20 Nov-3 Dec 1917. His memory is perpetuated on Panel 7 of the Cambrai Memorial at Louveral, Nord in France. He was one of the 7048 men to die in this battle for whom there is no known grave. Field reports for this fateful day in young Tom’s life tell us that his regiment had been deployed to re-enforce a position along the Hindenberg Line where the South Wales Borderers and the Newfoundlanders had previously suffered heavy losses. intervals and fair visibility. During that afternoon reports were received that the German forces had broken through the line and were entering the village of Marcoing. Allied troops were hastily repositioned, withdrawing from one position to strengthen another, and at some time during this day Tom, together with many others lost his life. In addition to the memorial at Louveral, Tom’s name is also inscribed on the Cenotaph in Southampton. The Roll of Honour listing the names on the City’s memorial also mentions a James Herbert Blandford who may be a relative. Interestingly the family’s obituary in the Southampton Daily Echo 30.12.1917 and the tribute in the Southampton Pictorial 23.01.18 both give Tom’s age as 20 years, but he was killed just 10 days before his birthday, so he was actually just 19 years old when he died.